As every chocolate lover knows, there really is nothing that compares to really fine chocolate (with the possible exception of really fine wine, and both, by the way, are spectacular together). It’s an experience that envelops all of the senses from its intoxicating scent, to its rich luscious appearance, to its velvety smooth texture and on to its ability to unleash bursts of varying and intoxicating flavors. It’s an experience that takes you away from the ordinary, even if for just a brief moment. The chocolate tree - also known as the Theobroma tree is said to have originated in the Amazon, where it grew under a protective canopy of the Rain Forest. Wild Theobroma trees can still be found there today. Theobroma is Greek for “Food of the Gods”. The consumption of chocolate dates back to the ancient Mayan and Aztec cultures of Mexico and Central America. It was valued so greatly, that it was used as currency as well as for important rituals, and it was mostly consumed by the elite class; rulers, priests, honored merchants and decorated warriors. At this time, chocolate was mainly consumed as a drink, however it was not sweetened like the hot chocolate we are familiar with today. Instead, it was consumed as a bitter frothy mixture called xocolatl. It wasn’t until the 1500's, when the Spanish conquered the Aztecs, that chocolate made its way to Europe and took on its more familiar sweeter flavor. This discovery was so treasured by the Spaniards that it was 100 years before it spread to the rest of Europe. Chocolate originates from the beans inside cacao pods which grow on Theobroma trees. These trees are usually found within 20 degrees of the equator. The cacao beans are removed from the pods and fermented, and herein lies the beginning of the difference between really fine chocolate and the regular mass produced chocolate we see today. Fermentation is where the chocolate develops its initial and most distinguishing characteristics. Not all cacao beans undergo this process. After fermentation, the cacao beans are then roasted and husked, and what remains, is called Cacao Nibs. The nibs are then ground up forming a rich dark paste that becomes chocolate liquor, the basis for the bitter chocolate used in chocolate confections. Alternatively, the cacao nibs can be pressed and separated into cacao butter and cacao powder. It’s all in the name - Is it Cocoa or Cacao? The Aztecs called the cacao bean Cacahuatl and this was shortened to Cacao (pronounced Ka-Kow or K-Kow for an easier pronounciation). 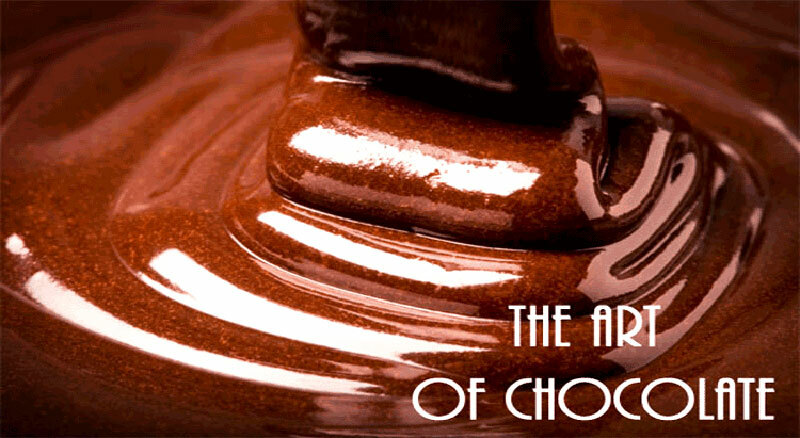 This term is now being used by chocolate artisans to distinguish their high quality product from the mass produced cocoa. It is also said that the early Spanish traders of Cacao beans mispronounced the word as Cocoa, and it has since remained. Cacao and Cocoa are now used interchangeably, although many now use Cacao to refer to the unprocessed bean and cocoa to refer to the powder that results after processing. Other factors that affect the flavor of chocolate are the ingredients and the processing techniques from fermentation to tempering. One of the ingredients that indicates a superior chocolate is the use of cacao butter. Many chocolatiers have taken to substituting this ingredient with lower priced products like vegetable oil or soy lecithin (Note to all chocolate lovers, most of the soy lecithin comes from genetically modified soybeans, unless it is specifically identified as non-gmo soy). Using these lower quality substitutes gives the chocolate a waxy taste. Of the three, the Forastero is the most common. It is the hardiest of the chocolate trees and its cacao nuts are also said to have the least complex flavors. Forastero beans are said to account for about 85% of the total cacao bean production and are used mostly in mass produced chocolates or blended with the Criollo or Trinitario beans. The Criollo tree was once the most prominent cacao tree in Central and Northern South America, but because of its low productivity and its susceptibility to disease, it is now the rarest of the three. It is however, the one that produces the most flavorful and aromatic beans, including flavors of caramel, nuts, vanilla and tobacco. And because of this, the Criollo cacao beans are the most prized by fine chocolatiers the world over. Criollo cacao beans account for about 1% of total cacao bean production. The Trinitario tree is a hybrid of the Forastero and Criollo trees. It has inherited the hardiness of the Forastero and the flavors of the Criollo. This bean is most likely to be found in fine gourmet chocolates either on its own or as part of a blend. Trinitario cacao beans account for about 14% of total cacao bean production. Unfortunately most chocolate companies know nothing about where their chocolate comes from. The farmers sell to brokers, who in turn sell to bigger brokers and the chocolatier is far removed from this process. This opens the door for abuse both in terms of the workers, which in many cases involve child slave labor and to the environment, leading to the degradation of the land and water. It appears the chocolate trade is, in many cases, still stuck in colonial times. We hope to bring you more on this in the future, but we've included a few links below to learn more about the chocolate trade. If you want to ensure the integrity as well as the taste of the chocolate you consume, look for chocolatiers who control their chocolate from the plantation right on to the finished product, a recent concept that is referred to as bean to bar. Chocolate gained a reputation as a sensual food because it is one of the rare foods that envelops all of the senses, and you can use all of your senses to judge if your chocolate is a high quality chocolate, yes, even your sense of hearing! The chocolate should appear smooth, and lustrous and without any flaws. This indicates that the cacao butter has been properly tempered. If the chocolate has a bloom or whitish appearance, it indicates the chocolate has been exposed to a change in temperature but does not affect the taste. The chocolate should feel smooth and silky to the touch and should start to melt on the skin within a few seconds. This also indicates a good cacao butter content. Chocolate is the only food known to melt at body temperature. When you open up a piece of high quality chocolate, you should be greeted with a subtle aroma containing hints of nuts, berry, fruit, vanilla or various herbs. It should not be an overpowering scent of chocolate, vanilla or nuts, as this indicates a lower quality chocolate where the flavor can easily be masked by such added flavors - lookout for burnt, musty or chemical smells. Yes you can hear a high quality chocolate. Break a piece of the chocolate and listen for a crisp snap. The chocolate should not shatter or splinter when broken. And the best part of all, taste. Allow a small piece of chocolate to melt on the front of your tongue where all the taste buds are located. The chocolate should melt quickly and release very pleasing sensuous flavors. A waxy feel will indicate a lower quality chocolate where the cacao butter has been replaced with cheaper vegetable oil. There should be a good balance between bitter, acidity and sweet flavors with no single flavor being strongly dominant. The initial taste should be the chocolate itself with the other more subtle flavors expressing themselves towards the finish. Remember however, that taste is subjective and the experience is a very personal one. If you are not enraptured by a chocolate you tasted, provided that the visual, feel, sound, and scent meet the requirements, you are likely dealing with a superior product and may simply want to keep trying other blends or varieties until you find your bliss! When selecting your chocolates, look for chocolatiers that control the entire process from bean to bar. This way you are assured the chocolatier is passionate about his creations and cares about the quality of all the ingredients used. This also ensures the integrity of the chocolate and that no child slave labor was used in its creation. Raw Chocolate is a newcomer to the scene and from all indications, it can be as decadent and delicious, if not more so, than conventionally produced chocolate, as the rich and intense flavors have not been degraded by any harsh processing. The added benefit however, is that the full range of abundant nutrients are left completely intact. So, not only are you participating in an indulgent experience, but you are consuming a superfood that is improving your health and wellbeing. Just a note, as with conventional chocolates, some brands will excel at their craft, while others may need to continue working to develop it. A less than exceptional experience should not taint all raw chocolates. We are hearing more and more about the health benefits of chocolate, and it appears that these have not been overstated, and if anything, have been understated. More will be coming on the health benefits of consuming chocolate, but generally speaking, chocolate is a nut and is a rich source of a number of essential nutrients, many of which are contained in very high levels. Coincidentally, many of these nutrients are those which our population is severely deficient in such as magnesium and iron. Chocolate has been found to be beneficial for inflammation, the brain and nervous system as well as cardiovascular and respiratory health but most importantly for its Bliss chemical anandamide.